Sado is like the Japanese Isle of Elba. It was there that the Emperor Juntoku and Buddhist priest Nichiren were exiled in eras past and it is there that a dissident punk rocker is imprisoned in the dystopian near future. Yet, the island environment he wakes to appears frozen in time, existing in a state of perpetual winter. 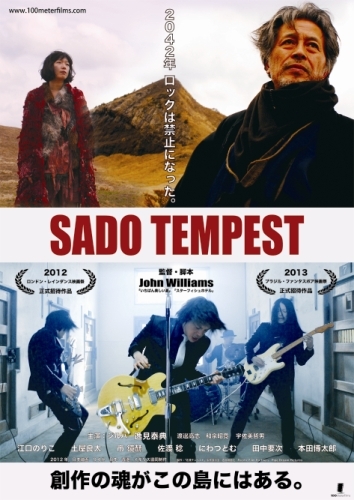 Amid the gloom, demons will haunt Welsh expat John Williams’ Noh-styled Shakespearean pseudo-adaptation, Sado Tempest (trailer here), which screens during the 2013 Brooklyn Film Festival. Juntoku’s band Jitterbug regularly yells truth to power during their gigs. This one will be their final one. The Agent Smith-like Sekihara drugs the lads backstage and whisks them off to Sado. Presumed dead by the outside world, they are now helpless captives of the brutal warden Sugi. There is also a strange woman named Miranda, who obsessively hums lines of a legendary demon song as she trudges about the place. Eventually, Juntoku suspects her ancient verses might hold the key to a supernatural renewal. Right, there’s some Tempest in here somewhere. Regardless, there is plenty of ethereal atmosphere, evocative taiko drumming, and Kappa like demons to transport viewers well out of the familiarity zones. Essentially, Shakespeare is one of several influences, just like the Zen Buddhist flavoring the pronouncements of Omuro, the Prospero figure. Williams clearly privileges mood over narrative, but there are some deviously subversive bits, as when the corrupt Sugi browbeats the band into recording that last album for their label to discover in the vaults. Fans of Jitterbug should enjoy hearing them do their thing. Yet, even through subtitles, the centerpiece “Demon Song” has a real old world vibe, in keeping with the film’s Shakespearean inspiration. Lead singer Yasunori Henmi does right by it, even if he is a somewhat stiff screen presence. While the cast largely provides deliberately strange and forbidding performances, there is something haunting about Noriko Eguchi’s Miranda. As the villainous Sekihara, Kill Bill’s Yoji Tanaka is also appropriately cold blooded and venomous. Dystopian cinema has rarely looked so barren and windswept. Nobody is apt to confuse Sado Tempest with Hunger Games or Battle Royale for that matter. Indeed, this is about as post-modern as Shakespeare and Noh Theater can get. Yet, the archetypal themes still resonate. 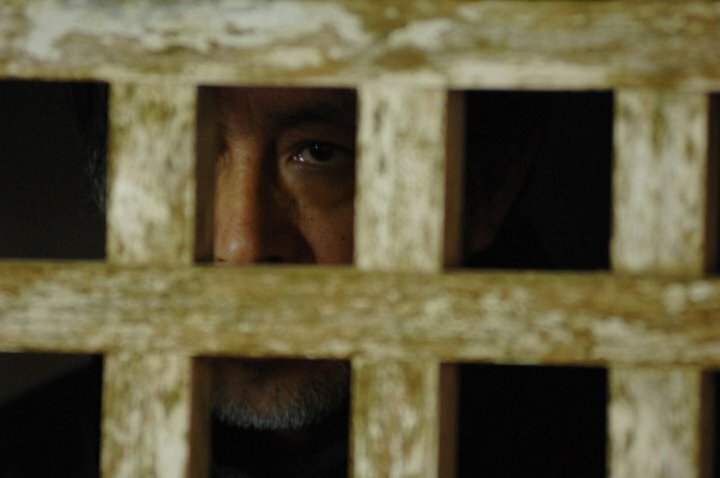 The sage Omura explicitly challenges conventional notions of time and narrative on Williams’ behalf, but the film itself is relatively linear. Nonetheless, Sado Tempest is hardly accessible for mass market audiences. Eerily hallucinatory, Sado Tempest is a must for cult cinema fans with a more post-structuralist intellectual bent. It screens this coming Sunday (6/2) and Monday (6/3) as part of this year’s “Magnetic” Brooklyn Film Festival.